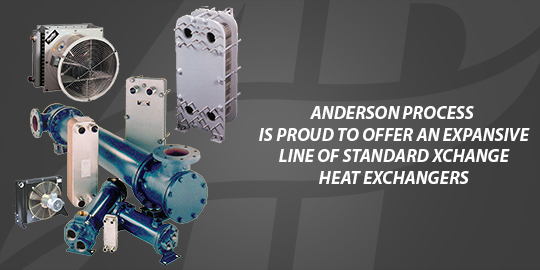 Anderson Process offers a number of heat exchangers engineered to drive reliable production and help our customers achieve maximum operational profitability. Click or tap the bar above, then scroll, to view the industry-leading manufacturers we represent for each of our heat exchanger technologies. Leading Heat Exchangers for Efficient Waste Heat Recovery. With the ability to reduce operating costs in industrial and manufacturing operations, efficient waste heat recovery technology is one of the most effective investments today’s liquid-handling operations can make. As a result, strategic heat exchanger selection and specification is essential to maximizing efficiency, and ultimately, the bottom line. Anderson Process’s experienced process equipment professionals guide our customers through the selection process to ensure the heat transfer technology you install is optimized for your operation’s unique needs. With decades of experience in the processing industry, Anderson Process’s in-house experts are familiar with the challenges facing the food and beverage, chemical and other manufacturing industries. However, many considerations specific to your fluid-handling application need to be evaluated, including inlet and outlet temperatures, liquid viscosities and volume, flow distribution, pressure requirements and equipment footprint. Anderson Process will analyze your operation’s overall processing objectives and recommend the optimal heat transfer solution for your long-term production goals. Because Anderson Process aligns itself with OEMs that continuously innovate to deliver state-of-the-art equipment solutions, we offer waste heat recovery technology from some of the most respected manufacturers in the industry, such as Standard Xchange. Our comprehensive line of heat exchangers includes heat transfer technology for both industrial and sanitary applications. From sanitary, easy-to-clean tubular heat exchangers developed to eliminate cross-contamination concerns, to plate heat exchangers that are capable of meeting the demanding heat transfer requirements of chemical processing and power generation, Anderson Process’s heat exchangers are optimized to promote maximum thermal efficiency. Fluid-handling operations that utilize our waste heat recovery technology position themselves to deliver consistent production yields while reducing their energy and maintenance costs.